View More In Toiletry Kits. 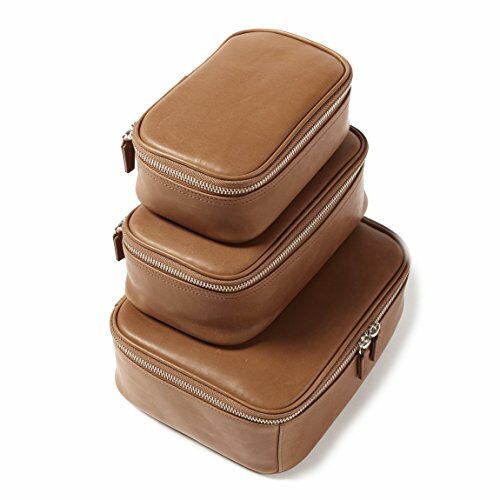 The Nested Travel Organizer Trio will keep your things sorted when on the move. Three sizes are ideal for carrying various travel necessities like camera batteries, charging cables, or toiletries. When not in use, the organizers can be nested within each other for compact storage. Each are lined with waterproof fabric and have elastic loops sewn at the base for those items you want to keep together and in place. Our Berlin leather features rich color and a smooth, naked finish. Coming from a 5th generation German tannery, this collection is made using aniline, vegetable-tanned leather. This process results in a quality leather that will continue to develop its color and texture as you use it.